So you’ve found your dream house, you’ve come to terms with the seller on price and you are under contract….now comes the time for a home inspection! What is it? How much is it? Do you really need it? It’s just like what is sounds…a home inspection is conducted by a licensed home inspector to check out the property for you. The home inspection is typically paid for and selected by the prospective buyer, although in some cases, a seller may have hired a pre-listing inspection. The inspector will test the home’s systems (electrical, plumbing, HVAC, etc) to make sure they are performing properly and safely. The inspector will also look at the home’s structural components–the foundation, roof, walls, etc. Basically, an inspection is having someone look at the home with expert eyes so that you know exactly what you are buying. Keep in mind that a home inspection is NOT a guarantee of future condition, but a report on the condition of the home and it’s components on that day. Unfortunately, inspectors don’t have X-ray vision, so they can’t see inside walls or into areas they cannot access. A home inspection is optional. However, I would strongly encourage all of my clients (or anyone buying or selling real estate) to get a home inspection. Yes, it is an extra expense. Yes, it is optional. However, not everything will be listed on the seller’s disclosure–the current owner may not even be aware there is a problem. Best case scenario, you get a “clean” inspection and there are no major problems. A few hundred bucks will help you sleep much sounder knowing that you are making a wise purchase. Worst case scenario, major issues can be uncovered that can save you thousands of dollars down the road. Caveat Emptor (“Buyer Beware!”–or as I like to translate it…buyer be AWARE!) The more you know, the better you will feel about your purchase or the better you will feel about knowing when it is time to walk away. The costs can vary depending on square footage and provider, but price typically ranges from $300-500. You can also add a termite inspection, pool/spa inspection, storage building inspection and septic system inspection if needed. You can select any inspector you wish. If you don’t know who to hire, ask your REALTOR® for a few suggestions. Timing varies depending on the size of the home, but typically a few hours. There is no such thing as “failing” an inspection. The inspection is not graded. The purpose of the inspection is so that there are no surprises once you’ve purchased–you know exactly what you are buying. Knowledge is power! 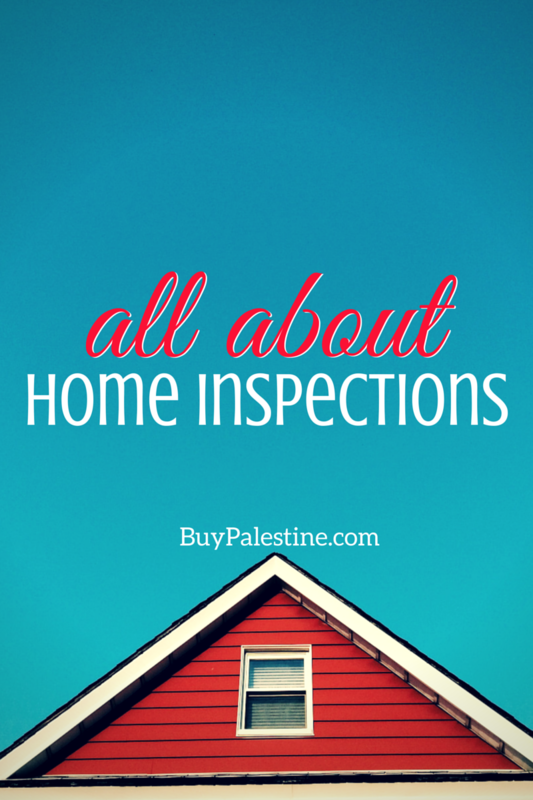 What happens after the inspection? What if there are problems found at the inspection? Problems WILL be found. The inspector is paid to find the problems, not the perfections. Unfortunately, there is no such thing as a “perfect house” (at least, as far as an inspection report goes). Every home inspection will uncover something, even an inspection on a new construction home! However, keep in mind that the purpose of the inspection is knowledge. 1. Proceed with the purchase – all of the findings of the inspection are satisfactory to you and you are more secure in the knowledge that the house is a good fit for you. 2. Negotiate Repairs – If there are items that are needing repair, you can request repairs or repair credit from the seller. In my opinion, repairs should only be requested if they fall into two categories: A) Broken; or B) Safety. Keep it in perspective. You never want to lose your new home over a $50 repair. Your agent will discuss and formulate a game plan for a repair request, if needed. 3. Cancel the Purchase – If the problems are too many for you to be comfortable with the purchase and the seller can’t or won’t make repairs, you can terminate the contract as long as you are within your option period. Discuss your options with your Realtor if this ends up being the case. What if the inspection findings report is a long, long list? A long inspection report is normal. Just because there are findings (and there will be), it is NOT a reason to panic. There will be many photos and general property code information, as well as your home inspection’s findings. Inspections are based on today’s building codes and not the code from when the home was built. Building codes, methods and materials change quickly, so many items on an older home will have the items that are not up to the current code listed as deficiencies. This does not necessarily mean there is anything wrong with the items (as long as they are performing correctly), it just means that they would not be built/used in the same way if the home was built today. (Example: A home built in the 1950’s likely will not have GFCI outlets in the kitchen or bathrooms, unless they were updated later. If a house were built today, it would not pass city code unless it had GFCI outlets installed in kitchen/baths.) Your inspector will cover this as well. Repairs – What should you request? There is no blanket answer for this, as every house and every buyer is different. It all depends on what matters to you as the buyer. Not all deals will need to have a repair request made. This is not an opportunity to “get something for nothing,” and not every inspection uncovers items that need to be repaired in order to close the sale. You, as the buyer, need to decide what is important for you in moving forward. At the end of the day, you are the purchaser and it has to be right for you in order to move forward with the purchase. Work with your agent to determine which items (if any) should be requested for repair. Keep in mind that the seller is not obligated to repair anything, but non-performing items and safety issues are in their best interest to negotiate repair or compensation in order to sell. Please note that I am not a home inspector, I am a Realtor®. But as you can see, I highly recommend getting a home inspection. It could be the best couple hundred bucks you’ve ever spent! If you have any questions, I’d love to hear them.